Huge reduction of the number of manual communications with the customer -> save time -> save money. In addition, normally these communications with the customer are of low added value, as they normally are repetitive. If you want, you can set it all for your customers to auto check-in. Use Rental Ninja Statistics to count the number of bookings you have in one year and multiply it by the price you pay for a check-in or count the minutes/hours you take to make a check-in by yourself! Worths it eh! Gather all the information you need for the booking prior to the arrival day! 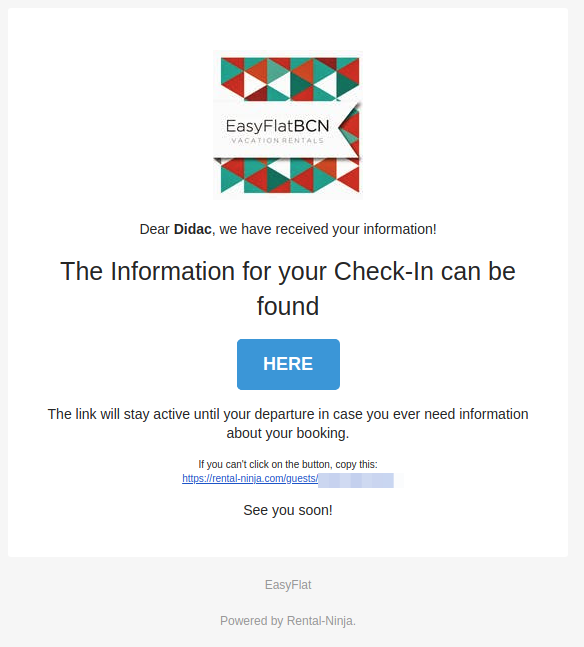 Passport number and photo, confirmation of the check-in time, and much more! 1- The guest receives an email (the sender name will be your company name) requesting to fill a pre-check-in form. If he/she does not, is sent more emails according to your selections in the "General Settings" section. 2- The customer fills the form. They are asked for their email address, which might be very interesting for you to send him messages containing anything you want to send, as some channels ban attachments to their email addresses. In addition, you can also request for the Passport/ID number and also a picture of the document. Set this also in the "General Settings" section. 3- The results of the form are saved as a comment in the booking. You can see it via your mobile phone or in the website. 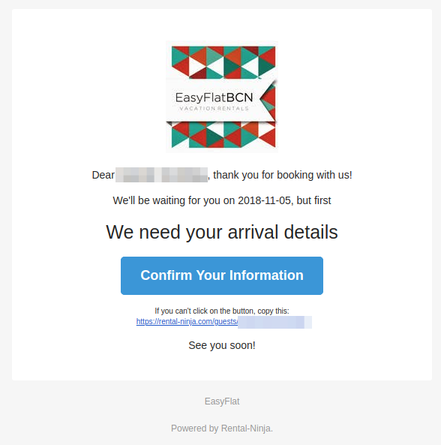 You can also see and modify the form information by going to the website, search for the booking in the "Bookings" section, and click on the "Pre-check-in Form" button. 6- Now the guest is able to see all the information needed for the stay in the Guest App: check-in information, rules for the rental or any information you want to share with him. And thanks to the way the App is designed, accessible also offline (in case your Rental is so remote that your customer does not have internet access). To know how to customize this information, refer to the article exclusively dedicated to the Guest App. In the case that the client does not want to / is not able to download the app, you can send him the pdf of the guide or a link to download that pdf. Refer to the same article to know how. 7- The guest will be able to contact you the check-in day in case of need thanks to the phone numbers provided in the Guest App. How to turn all this on? To start taking profit of all this automatic communications with your guests, you just need to turn it on. However, we first recommend you to provide all the information you want to show in the Guest App, in case you want to use it. Check the article exclusively dedicated to the Guest App to know how to do this. Once your Guest App is ready to be shown to your customers or you just don't want to use it, you can turn the communications with the customer on. Go to the "Guest Module" section, and to the "General Settings" area. Enable the Guest App and the automatic pre-check-in emails. Then choose the frequency that the emails for the form will be sent and choose whether you want to ask for Passport number and photo of the main page or not. You can also choose to send & show the guest the Check-in details that you can write in BookingSync, on each rental, where you edit everything about each accommodation. If you would like to turn on the SMS messaging to your guest requesting them to fill the form, just put the switch to the "on" position in the General Settings page of the Guest Module. You will need to provide a sender name, that will appear as sender of the SMS to your guests. Then choose also when do you want to send the messages with the drop-down menu. Each SMS costs 0.09€ and will be added to your next bill. However, there are some countries where the maximum number of characters in one SMS is only 40. In those cases, we need to pay for 2 SMS to send the entire text to the customer. You will then be charged 0.18€ in those occasions, but that will not be a common case unless you have many guests from those countries. The deactivation of the SMS sending is instantaneous, so if you just want to try it for some days because you wonder about having a big bill for the next month, turn it on and off at your will. Ask us about this if you need more information! 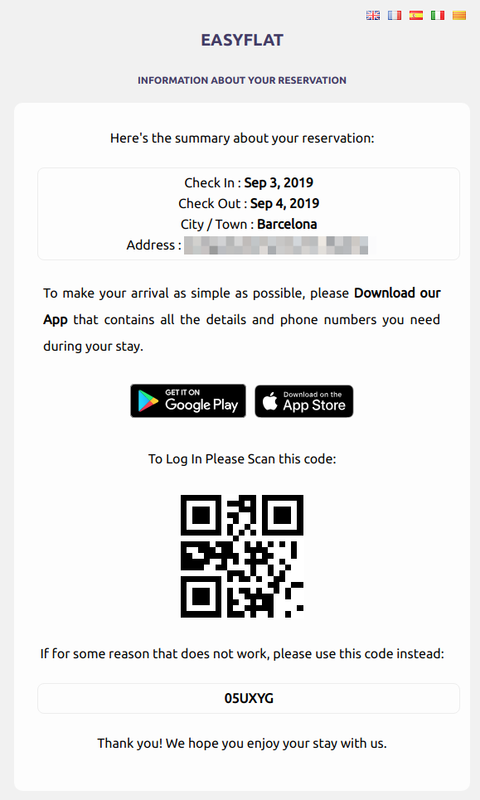 In the event that you don't want to use the pre-check-in form but you do want to use the Guest App, you should send the QR code and the Reference number of the booking to the customer. You can do so using the Notifications app of BookingSync. Ask us about this and we will show you how to do so! You will only need to copy a text in one of the emails you send to the customer. The Guest Module is included in the Professional plan. However, you can test this features while you are on the Rental Ninja free trial.